In 2015 I reckon I read a book a week however I made a bit of ‘schoolboy error’. Instead of writing about what i’d gained, or learned, or just enjoyed from each book….erm, I didn’t! So in 2016 I’ve had an idea. Every week I’ll write about the books I’ve read on www.chrisdaems.com. This should help me remember what was great (or not so great) about each book but also might help readers of this blog decide whether it might be something which is worth them picking up and reading.. The aim is to read at least a book a week in 2016 and write about every one. So here goes..
Jay Samit, the author of this book, has an interesting background. He’s been an entrepreneur in the entertainment industry, worked for large corporate organisations (Sony and Universal Stuidos) as an ‘internal disrupter’ (which sounds to me like quite a cool but potentially frustrating job) and helping organisations such as Ebay and Linkedin. In ‘Disrupt you’ Jay shares his philosophy that we should, personally and professionally by looking at disruption as a positive thing. Whilst there is loads of useful insights in this book however the elements which interested me the most is where Jay provides examples of how disruption improved specific elements of specific industries. Now Jay’s background in the entertainment industry means that many of the examples are related to this sector and there’s plenty of talk about how initially Napster, and then Apple (and now streaming services like Spotify) have changed the music business fundamentally. The first one which springs to mind is the ‘zombie idea’. A ‘zombie idea’ is an idea which as much as you try to stop it….just doesn’t lie down! It’s a business idea which seems immune to all challenges and Disrupt yourself is worth reading to understand a bit more about what Jay feels makes a Zombie idea. The importance of having a plan, but an understanding that the plan you put in place will never be as smooth as you think. The importance of ‘pivoting’ (starting with an initial idea, testing and then changing if appropriate). Why and when running a business as cost efficiently as possible is appropriate and why crowdfunding have disrupted (that word again) traditional methods of business funding. 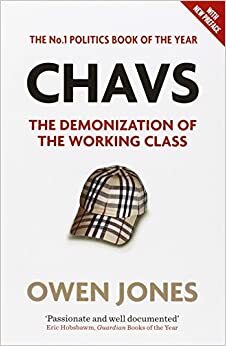 “Chavs”, Owens first book, talks about why he believes the media and right leaning politicians have promoted the idea of an underclass in British society and why this ‘demonization’ (Owen’s word not mine) is being used as a political tool. In “Chavs” Owen explores why he believes that for a number of decades there has been a intentional political desire to erode ‘workers rights’ and destroy some of key industries which were prominent in earlier decades in the UK. There are some compelling arguments in this book. In particular how politicians by dint of their upbringing and work experience mean that they don’t understand the challenges faced by huge swathes of the population and why the rise of nationalist views may be in part due to the loss of jobs over recent decades in the UK industrial sectors. The book also benefits by having input from politicians and political commentators across the spectrum. However the book, in my opinion, suffers from a few blind spots. Firstly Owen argues that the death of many of the traditional industries which created so many jobs in earlier decades is in the main due to the political machinations of the conservative and “new Labour” governments of the past few decades. However the fact that that many other factors which would have meant the eventual decline of these industries (including being increasingly unable to compete in a global economy) are mentioned but on the whole ignored. Owen also talks about how recent both the conservative and ‘new labour’ governments of the past few years have focused on individual responsibility and empowerment at the detriment of community. Whilst I understand the sentiment I just don’t see how individual empowerment and a sense of community (either in a personal or professional sense) are mutually exclusive. However the issue for me with the ‘unions mean a better outcome for all’ argument is it can and has created a working culture of ‘managers vs workers’ which regularly results in less collaboration and more disputes. However to pretend that the panacea is a socialist society where equally imperfect worker collectives let by equally imperfect individuals have more power is in my opinion is an argument which falls at the first fence. That being said Chavs an interesting book well worth reading and I’ll be picking up Owen’s second book, The Establishment, in due course. The Devil in the White City by Erik Larson is the true story of the 1893 World Fair held in Chicago. It tells the story of Daniel H Burnham, an architect and one of the main individuals responsible for the success of the fair and H.H Holmes, a serial killer who used the world fair to attract his victims and commit his heinous crimes. It’s fair to say the World Fair had it’s share of challenges. A lack of time and often money, a barren often inhospitable landscape to build on and political infighting. Which makes the work Burnham and the massive ‘supporting cast’ (which includes the inventor of the Ferris wheel and Thomas Edison) even more incredible. However despite the challenges they managed to make the world fair an apparently incredible place to visit. In contrast the tale of H.H Holmes, a psychopathic opportunist who was both charming and brutal, explores the darker side of Chicago at the time. A city where crime often flourished. Where opportunity flourished but also Chaos. For me “The Devil in the White City” is a story of Heroes and Villians. The heroes whilst not possessed with any particular superpowers had bucket loads of belief, drive and a passion to put Chicago firmly on the map. …along with this throw in assassinations, accidents, death, life and everything in between it’s a compelling story well written and told…. I did mention that it’s also all true….didn’t I? So, here’s the first books I’ve read in 2016. Feel free to comment with your thoughts on any books I should read, whether you’ve read any of the books I’ve read and what you thought and I look forward to sharing some of the other books I’ve read throughout 2016!